There is much to be said for updating a classic. Left untouched and unchanged, even the finest art can lose some of its impact with overfamiliarity. What was once vital and captivating becomes stately and staid. A good cover version can refract genius and help you appreciate it anew. Take Jeff Buckley's Hallelujah, as both a unique take and haunting eulogy to Leonard Cohen's masterpiece. Staging West Side Story in a historic departure from the sacred source orchestration and choreography was always going to be an audacious endeavour. It was bound to live or die by how the new steps and strains capture the original spirit. Thankfully, director Sarah Frankcom, choreographer Aletta Collins, and Musical Supervisor Jason Carr absolutely nail it. This beguiling interpretation is both faithful to all the most vital elements of the original, and at the same time thrillingly effective - and affecting - in its innovations. The oft-parodied finger-clicks and ballet kicks are largely stripped away for more organic movements. It is fitting it meets the world in a city where the masculine grace of Northern Soul found a home. The cornerless cauldron of the Royal Exchange lends itself to intimacy, and so works well as a cramped Hell's Kitchen. You completely buy into the premise of gang turf being at a premium as the scaffold staging is forced upwards. Each audience member could be looking down from their Upper West Side apartment, or sitting on a nearby stoop, as juvenile delinquents race by. At the centre of it all are of course Tony and Maria. Gabriela Garcia radiates raw energy throughout; for someone so physically petite, she has huge charisma and remarkable presence. And in Andy Coxon she has the perfect foil. There is a wonderful subtlety to his performance, combining natural authority, love-struck goofiness and deadly devotion. Together, they are beautiful and heartbreaking. That said, this is so much more than a love story. Frankcom has enough trust in her soulful leads to focus more acutely on the societal themes of the play - themes that still feel depressingly relevant. 'Gee Officer Krupke!' feels less like comic relief and more a biting satire of buck-passing politicians who blame youth violence on everything but themselves. Like so much here, it feels achingly prescient. The decision to have Emily Langham's Anybodys sing 'Somewhere', high above her bewitched cast members, is inspired. Suddenly a dreamy love song becomes a tragic ode to wasted potential. And that's the lingering sense you are left with. Nothing has changed in over half a century; history repeats itself in the most needless way. Art like this matters more than ever, and it is richer for its reworking. 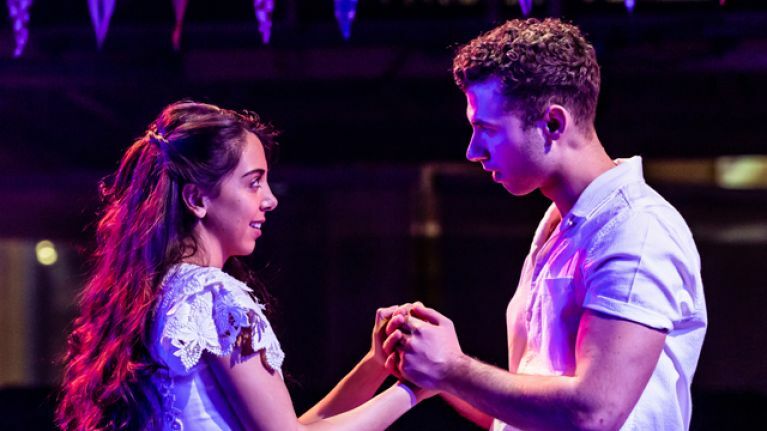 You can catch West Side Story at the Royal Exchange until 25 May.